The Thameslink north-south rail link across London is nearing fulfilment. Despite the timetable problems back in May 2018, the enhanced capacity on the route is already easing the daily commutes for thousands of people. When it reaches its full potential of 24 trains per hour (tph) in each direction through the central London core, an even bigger demand is to be expected. The overall programme, covering five route areas, will have cost £4.6 billion, including the provision of 55 new 12-car and 60 eight-car trains, running through 10 signalling centre areas of control on track used by 11 train operating companies (TOCs). Much of the project’s glamour has focussed on the new stations (London Bridge and Blackfriars in particular), its civil engineering, especially the Bermondsey flyover, and the new ETCS with ATO (European Train Control system with Automatic Train Operation) train control system. There has been very little mention of the telecommunications network, without which none of the above could have happened. Yet all the telecoms requirements have needed a massive design and implementation project that has equalled the other disciplines in the need for creative thinking and new ways of providing service. To understand what has been involved, the London & SE section of the IRSE hosted an evening meeting in January whereby Network Rail could demonstrate just how complex and wide ranging have been the telecom elements. Rail Engineer went along to learn more. Whilst the Thameslink routes both north and south of the Thames and through the central core had been equipped with GSM-R, this was primarily associated with driver to signaller voice communication. As such, the capacity, coverage and resilience of the radio network was less than would be required if used as a bearer for ETCS. An upgrade has therefore been necessary – the responsibility of the telecoms function within Network Rail for the control and infrastructure equipment but also involving the TOCs for the ETCS train-borne mobile equipment. The ETCS/ATO area extends from Kentish Town and Canal Tunnel junction in the north to Elephant & Castle and beyond London Bridge in the south. To improve the robustness of the system, most of the previous radio cells have been split with 15 new Kapsch 9000-series base stations being purchased to replace the existing nine Kapsch 8000-series units. All base stations now have a double landline connection, the majority using diversely routed fibres plus a 12-hour standby power supply at each site. Much of the central core section is equipped with radiating cable and 16 radio cable repeaters are needed to keep the signal strength at the required level. GSM-R radio performance has to take account of the channel availability within the 4MHz uplink and downlink allocation. This leads to two constraints. Firstly, in congested areas like London where multiple rail routes are in close proximity, channel allocations, base station locations and aerial alignments have to be carefully planned to eliminate, as far as possible, the risk of co-channel interference. Secondly, whilst having a circuit switched connection (an individual train seizes and holds an available timeslot for the duration of use) is just about ok for occasional voice traffic, the data requirements for ETCS operation mean that a continuous connection is required. With circuit switching, there is simply not enough capacity within GSM-R.
Fortunately, development and proving work in the UK and Europe has determined that packet switching is an acceptable alternative for the future. Even if the occasional packet is lost, the data transfer is sufficiently guaranteed for reliable ETCS information updates as well as enabling a considerable increase in capacity. The upgraded GSM-R network has been extensively tested, both for coverage and resilience. Additional hardware duplication has been provided to minimise the chance of equipment failure that would result in ETCS data being unavailable. An additional feature with the new Kapsch base stations is a Voltage Standing Wave Ratio alarm, which monitors the radio signals such that any deviation from the norm is detected before a fault actually occurs. The overall monitoring of this, and indeed the nationwide GSM-R network, is undertaken by Network Rail Telecoms (NRT) from its Network Management Centres. King’s Cross fire of 1987. 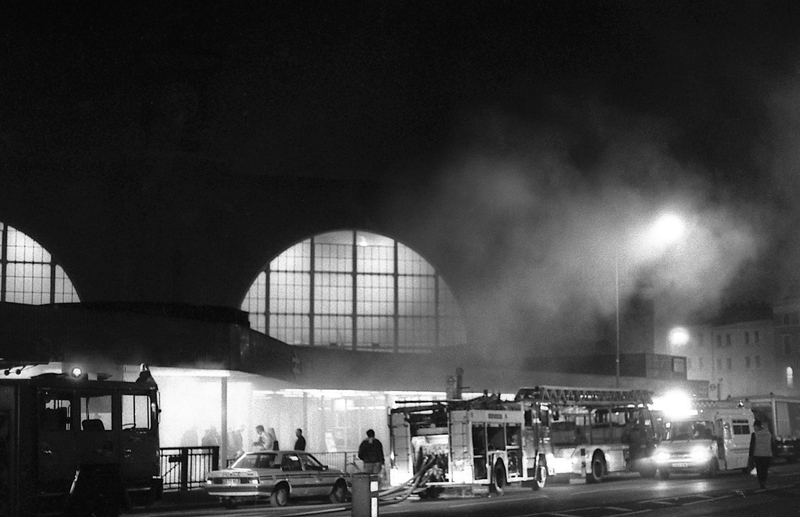 The King’s Cross fire in 1987 (above) brought home the need for the emergency services to communicate together effectively in all locations, including underground railways. Since Thameslink in largely underground in the central core, provision has had to be made to enable radio systems covering police, fire and ambulance services to communicate in any emergency circumstances. Using Tetra technology in the UHF band, all police forces (including British Transport Police – BTP) and the ambulance service have now converted to Airwave, which is the same technology that London Underground uses for its track-to-train communication. Providing Airwave coverage on LU is therefore relatively straightforward. Adjacent LU and Thameslink locations get coverage by default, but, elsewhere on Thameslink, it has been necessary to feed Airwave signals down the same GSM-R radiating cables, but with different types of repeaters. The fire service has continued to use a different system – Fire Ground – which again has its signals injected into the same radiating cable. The Fire Ground system had already been provided in the St Pancras area as part of the HS1 communication requirements, so this system was extended into Thameslink to prevent inter-channel interference. The erstwhile York Way tunnel at King’s Cross has been retained as an access point for the emergency services. The crucial need for a traffic management system (TMS) to regulate the Thameslink train service through the central core when 24tph eventually happens was described in issue 160 (February 2018). Using the Hitachi Tranista system, this will look at real-time train movements from as far away as Luton and Hitchin in the north and Sevenoaks and Three Bridges in the south, and to then constantly calculate the optimum pathing of trains should any of them be running late and not arriving at the central core in the timetabled order. Getting TMS to be effective is a complex challenge and demands crucial telecom and data links as part of the design. Such is the foreseen dependence on TMS that two parallel systems have been procured (A and B) to provide the necessary resilience. Capturing the constant stream of data from all the outlying locations has meant the provision of two independent Ethernet rings of 250Mbit capacity to deliver the train running information. The FTNx fixed telecommunications network provided by NRT (Network Rail Telecoms) as a nationwide IP (Internet Protocol) data service has been employed for this task. This means that all TMS data is IP-based, which was a logical way forward in any case. 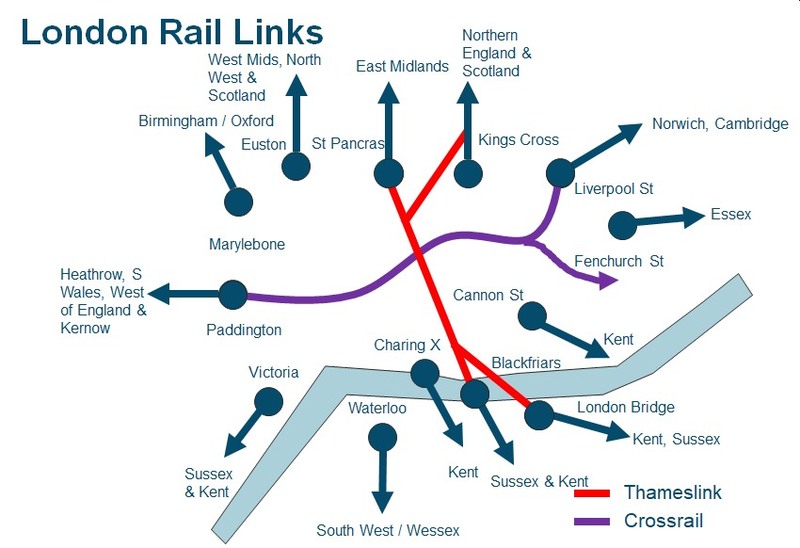 As traffic management systems spread to other areas of the country, so the Thameslink TMS system will link into these and thus potentially provide train running information from even further afield. 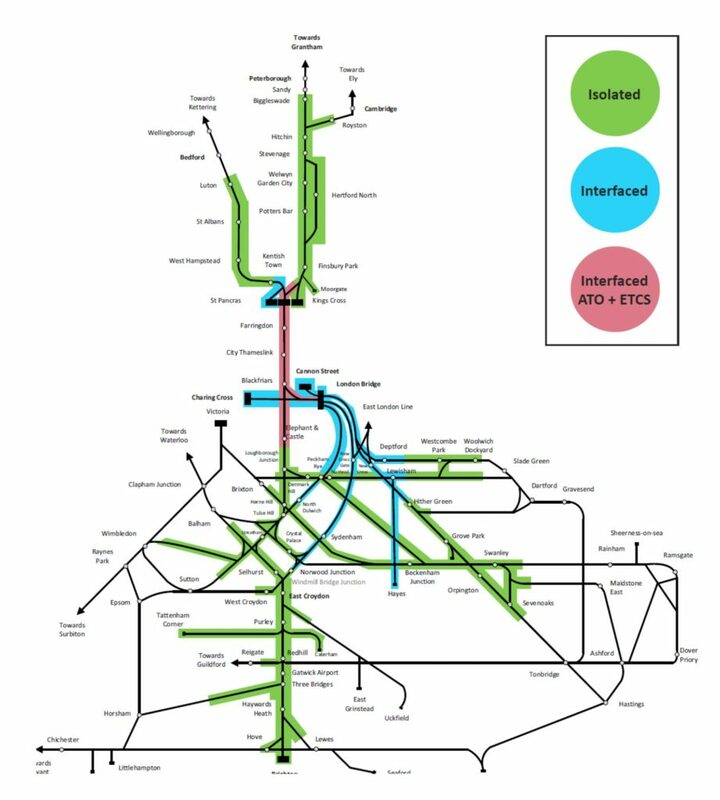 Whilst the output from TMS is an advisory tool to the signallers, who will be able to change the routing plan if they think it advisable, eventually TMS will link into the ARS (Automatic Route Setting) facility within the rail operating centres (ROCs) and thus set train paths automatically. The signallers are to be provided with web-based Train Graphs at their workstations so that they can see the overall train service performance at a glance. 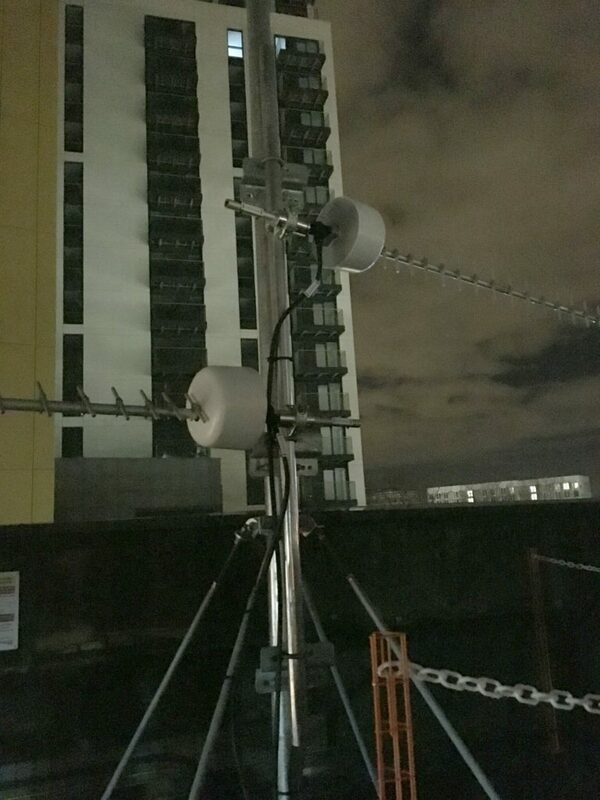 Antennas at Elephant & Castle. Not only is a comprehensive telecom and data network required for TMS, but the very extent of the Three Bridges ROC operation means that similar connectivity would be required for controlling all the outlying signalling equipment. Traditionally, this would have been done by low-speed data links provided as part of the signalling design, but the cost of such a provision would be considerable and questions were asked as to whether a more cost-effective solution could be devised. The resulting specification called for a comprehensive fibre and data communications network (DCN) and, with the FTN network already in place, using this was an obvious choice. However, just taking the available bandwidth without any provision for local control gave a measure of unease and thus a compromise was needed. A comparison of options to be made with identification of any diversity shortfalls. The resultant network has moved the Network Terminating Point (NTP) from the FTN router to the signalling equipment rooms, with an independent network control centre established at Three Bridges working in conjunction with NRT. The DCN has been renamed TSPN (Thameslink Signalling Private Network – known colloquially as Teaspoon) and gives four independent paths from the main signalling equipment rooms back to Three Bridges ROC. Every signalling trackside module has an IP address layered to SIL4 (safety integrity level 4) standards. Close co-operation has been needed with the NRT control centre staff and this involved considerable training to ensure familiarity with the critical network requirements. 140 routers are employed to start with, and more will be added once the Hither Green area is converted. Since start-up four years ago, only two faults have been recorded, one a power supply problem, the other a router failure, neither being service affecting. All stations in the central core need to give out comprehensive information to the passenger plus sophisticated monitoring of security. Included within this are customer information screens (CIS), public address and CCTV. During the early stage of the project, the displaced CCTV recording equipment from King’s Cross was relocated to London Bridge, so that output from the existing 400 analogue CCTV cameras could still be recorded. These cameras were connected to the new information network by the use of analogue-to-digital converters, prior to them being replaced during the rebuilding. At London Bridge, new equipment has been provided throughout, based upon an IP station data network consisting of two-core switches forming two VLANs in ring formation. Connected to this are 700 new high-definition Bosch cameras, with recording equipment to match, plus a video wall in the control room. The cameras are also viewable from Three Bridges ROC and the BTP control room at Victoria. 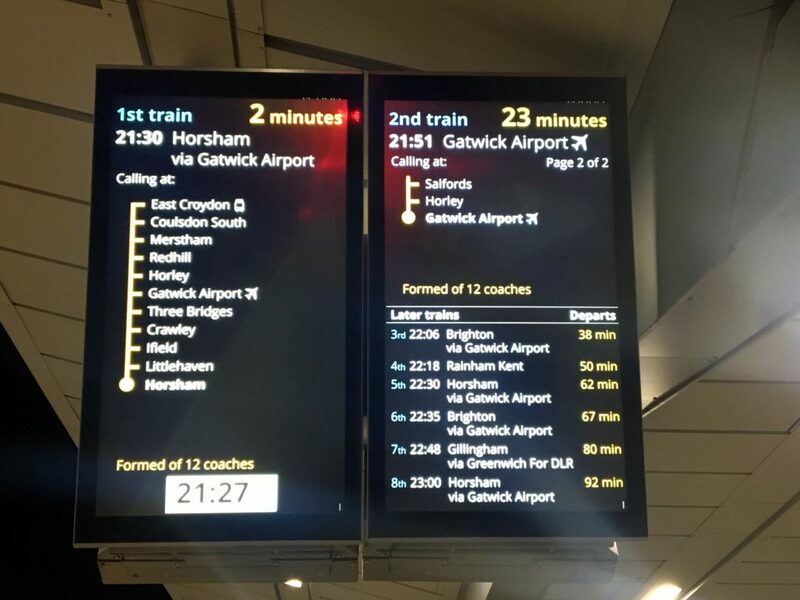 A total of 310 CIS train departure screens using Infotec LED displays are provided across all platforms. New PA amplifiers link into the system but include a hard-wired voice alarm facility to ensure availability in any emergency situation. Achieving the 24tph throughput in the central core requires critical control of station dwell times. These are timetabled at 60 seconds, allowing 42 seconds for passengers to alight and board. Automatic door opening is employed but CIS information is crucial to conditioning passenger behaviour. Train summary displays are provided showing the time until the next train and the six subsequent trains. These use TFT (Thin Film Transistor) technology, with past concerns over display life having largely been overcome. Alternate units go into ‘sleep mode’ at night to prolong life. Still to be commissioned is an overall integration and monitoring system for all the Thameslink central stations. A contract is in place with Telent for the provision of its MICA (Management, Integration and Control of Assets) product, with the hardware already installed at Three Bridges. Used previously at Clapham Junction and London Bridge, the system will give visibility of all telecom facilities at every station. In addition to CCTV, PA and CIS, the system will monitor lighting, lift and escalator alarms, station radio, security and fire alarms, and will also monitor dwell times and passenger congestion, with an alarm being generated if limits are exceeded. The benefit of MICA is that different manufacturers’ products can be monitored, regardless of type and age, thus avoiding the replacement of assets that still have useful life. In this modern age it is a commonly held view that telecoms will just be there, akin to water in the pipe and electricity at the socket. If nothing else, this account shows just how complex the provision of telecom facilities is on a route such as Thameslink. Thanks to Tom Chaffin and Stephen Brown of Network Rail for delivering such an elucidating explanation. SPECIALIST AREAS Signalling and telecommunications, traffic management, digital railway Clive Kessell joined British Rail as an Engineering Student in 1961 and graduated via a thin sandwich course in Electrical Engineering from City University, London. He has been involved in railway telecommunications and signalling for his whole working life. He made telecommunications his primary expertise and became responsible for the roll out of Cab Secure Radio and the National Radio Network during the 1970s. He became Telecommunications Engineer for the Southern Region in 1979 and for all of BR in 1984. Appointed Director, Engineering of BR Telecommunications in 1990, Clive moved to Racal in 1995 with privatisation and became Director, Engineering Services for Racal Fieldforce in 1999. He left mainstream employment in 2001 but still offers consultancy services to the rail industry through Centuria Comrail Ltd. Clive has also been heavily involved with various railway industry bodies. He was President of the Institution of Railway Signal Engineers (IRSE) in 1999/2000 and Chairman of the Railway Engineers Forum (REF) from 2003 to 2007. He continues as a member of the IRSE International Technical Committee and is also a Liveryman of the Worshipful Company of Information Technologists. A chartered engineer, Clive has presented many technical papers over the past 30 years and his wide experience has allowed him to write on a wide range of topics for Rail Engineer since 2007.